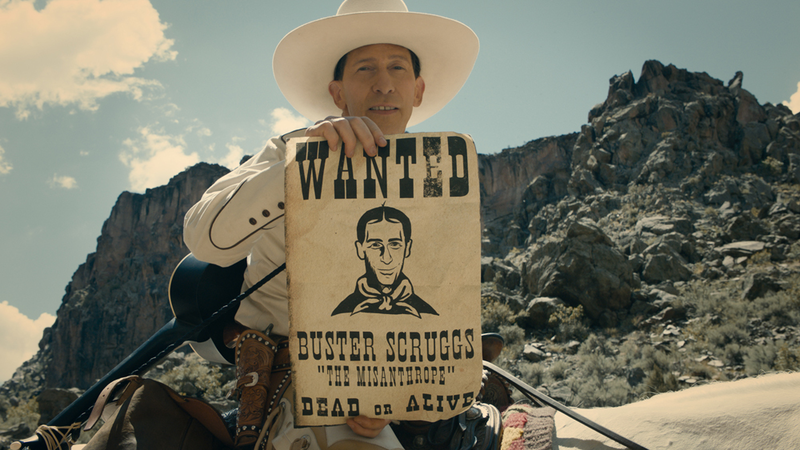 This 2018 Western anthology from the Coen Brothers presents itself as a storybook of six various stories, each running approximately 25-30 minutes long, set in the Wild West frontier with a central theme involving death. The opening vignette stars Tim Blake Nelson as the title character, a singing gunslinger who makes enemies during a dispute over a card game. The following episodes feature James Franco as a down-on-his-luck cowboy who resorts to robbing banks and Liam Neeson as a travelling showman whose act becomes increasingly less popular. 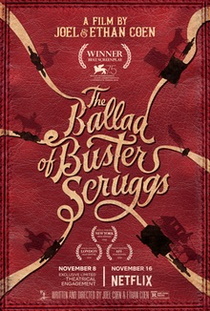 The longest (& arguably best) episodes come after the halfway point of the movie, the first of which stars Tom Waits as a grizzled gold prospector who discovers an untouched valley, where he painstakingly seeks his fortunes, followed by "The Gal Who Got Rattled", starring Zoe Kazan as a woman travelling on a wagon train to Oregon, where the death of her brother leaves her penniless and alone. The final story is set aboard a stagecoach, where the five passengers share stories with each other, and it's arguably the weakest of all six tales, ending the movie on a rather disappointing note. As with all these types of movies, everyone will have their favourite segment, since they are all of varying quality- all shaggy dog tales in the Coen Brothers' usual style, but they all have an authentic feel about them, as though they are all genuine Old West folk tales. A special mention also has to be made for Bruno Delbonnel's exquisite cinematography, thoroughly deserving of an Oscar nomination (at least), since all the stories are marvellously captured, particularly the vast vistas of the forests and desert. Over 20 years in the making, the Coen Brothers originally penned the stories as separate films, before deciding to put them all together with their usual blend of drama, mystery and black humour. Released on streaming service Netflix, it received a limited theatrical run at selected arthouse cinemas and is certainly worth catching on the big screen. The poker hand Buster Scruggs refuses to play in the saloon is infamously known as "the dead man's hand" (a two-pair of black aces and eights) as legend has it that was the hand held by Wild Bill Hickock when he was shot in the back of the head and killed by the coward Jack McCall.